Each week for our #FridaySharefest, we spotlight bloggers in our community to showcase some of the faces in our community of bloggers. This week our host is Tracy! Hi everyone! I am sure you all know me by now, but if not, my name is Tracy and I have two blogs, Eat, Drink & Be Tracy and one that is still a work in progress, Forking Around Town, Like many of you, I have been busy getting my kids ready for school and to be honest, I have fall weather on the brain. The brutal summer heat has taken a toll on me and I am looking forward to cooler weather and fall flavors. I actually saw Pumpkin Spice Cheerios at Publix yesterday, too funny! I love everything that Ellen from Family Around The Table does. 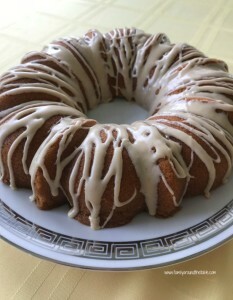 Her recipes keep me drooling and she did it again with her Maple Bundt Cake with Cinnamon Maple Glaze. This has my name written all over it and I can’t wait to make this and enjoy it with a hot cup of French Roast. As she mentions in her post, this would make a great tailgate dessert as well as an addition to your Thanksgiving table. Thanks for sharing Ellen! As usual, I have food on the brain and one of my favorite bloggers sure knows the way to my heart with her spelt pizza post. As many of you know, I am pretty crazy about pizza and eat in on a regular basis. With the new school year upon us and my household getting back into a more structured routine, I am focusing on healthier eating. I am a firm believer that you can always enjoy healthier versions of your favorite foods and this recipe is money. 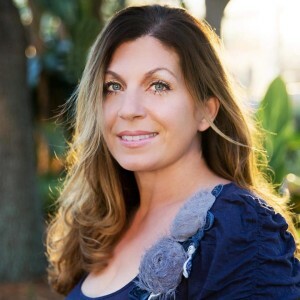 Nichole of Casa de Crews shares her favorite recipe for spelt pizza dough which is made with whole grain spelt flour for easier digestion. Lord knows I have never had a problem digesting any pizza (my instagram photos prove it) but as we get older, it is important to listen to our bodies. We have to be more in tune to what we are putting inside of us and simple changes make a huge difference. The less processed foods we have in our diets, the better. 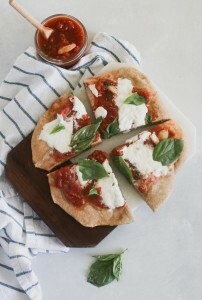 I can’t wait to try this recipe for pizza night at home with my kids. Once again, I am insanely jealous of Heather of Through Heather’s Looking Glass. Heather is always making me daydream with her wonderful posts and dreamy vacation pictures. This week she shares about day three of her three day media visit at Walt Disney World. On this day, she visited Disney’s ESPN Wide World of Sports complex and even got to hang with Goofy and Nick Anderson of Orlando Magic fame. 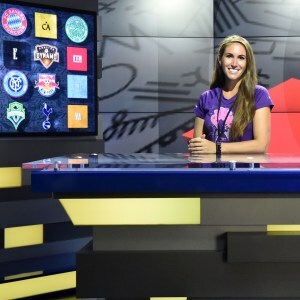 As a sports nut, she looks like she had an amazing time and even got to experience the real live working studio where sports reporting is done. If I could, I would love to be Heather for just one day! Be sure to read these great posts and have a wonderful weekend! Now we want to hear from you! Welcome to #FridaySharefest 8/10/18!